Kevin Durant and Klay Thompson have played integral roles in the shaping of the Golden State Warriors’ dynasty. But with free agency approaching, the band could be breaking up soon. Both Durant and Thompson are going to hit the market once the season is over, and neither seems particularly excited to think about that scenario. How do we know that? Because we have a painfully awkward “60 Minutes” clip as proof. Five Warriors — Durant, Thompson, Stephen Curry, Andre Iguodala and Shaun Livingston — sat down for an interview with the program. In the clip, the interviewer asks Iguodala and Livingston about the possibility of leaving the Warriors. As veterans, they scoff at the idea, knowing they are in the best place possible. Durant and Thompson, meanwhile, seem like they no longer want to be there. Ugh. That’s so awkward it hurts. Durant simply looks down throughout the entire answer. Thompson nods and then looks around nervously. While Curry, Iguodala and Livingston laugh at the idea of leaving the Warriors, both Durant and Thompson uncomfortably show zero emotion. 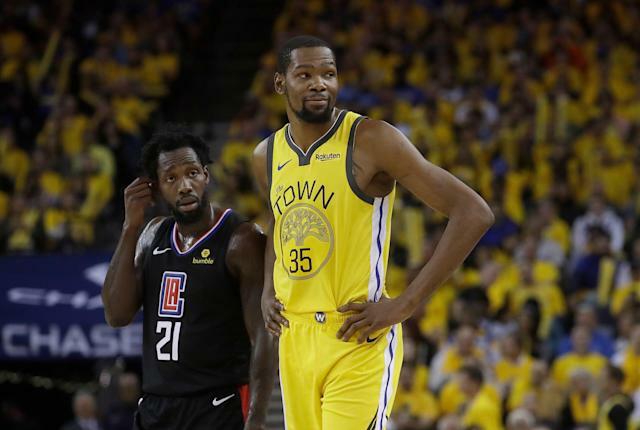 Now is probably a good time to mention the Warriors blew a 31-point lead during Monday’s game against the Los Angeles Clippers. The team also lost DeMarcus Cousins to a quad injury during the contest. With the win, the Clippers managed to even the series 1-1. Game 3 will take place Thursday. Things might end up fine in the end for Golden State. The Warriors are still talented enough to run through the postseason and pick up yet another ring. But if this short clip is any indication, winning it all won’t be enough to keep Durant and Thompson around. They don’t seem excited about the idea of sticking around.